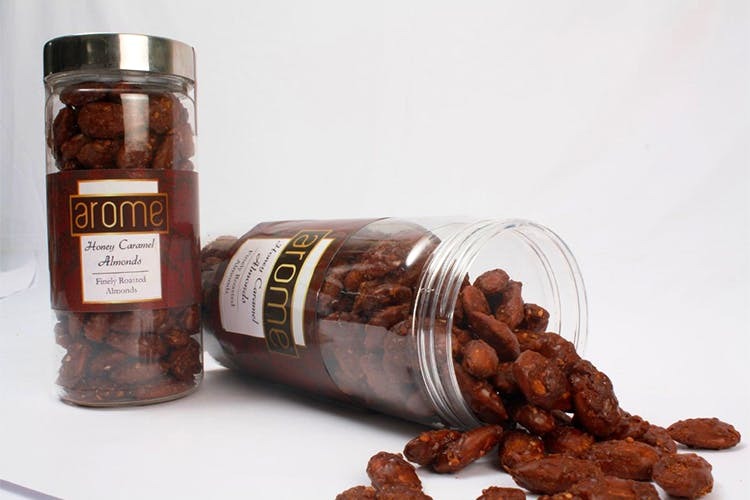 Arome is a premium dry fruit store with branches in Santacruz, Mahalaxmi and Thane and it sells some fine quality dry fruits that are perfect for when its snack time. Arome is a premium dry fruit store selling an amazingly unique range of flavoured dry fruits. The store we visited in Mahalaxmi is all wood and glass. There are shelves upon shelves of tins holding flavoured dry fruits that you can sample from before making a purchase. So taste from a variety of flavours – pan raisins, strawberry raisins, coffee almonds, pani puri cashews, chocolate cashews, peri peri almonds and more! Do not miss out on the paan-flavoured raisins, they’re our favourite. If you’re a caffeine addict, go for the coffee almonds. They sell regular dry fruits as well, but we’ve always gone there for the yummy flavoured ones. The store is not really large in size. However, good use of the space has been made in terms of the arrangement of shelves. The staff is polite, patient and can help make recommendations. They also cater to gift orders and we think they will make for some great party flavours or a lovely gift to take to someone’s home.